Punch Drunk Moustache is back and with more artists and pages. This volume features 10 artists, namely John-Paul Balmet, Molly Denmark, Andre Kirk, Dela Longfish, Jim Moore, Will Nichols, Carlos Sanchez, Jeff Sangalli, Amy Beth Christenson Smith and Chris Voy. 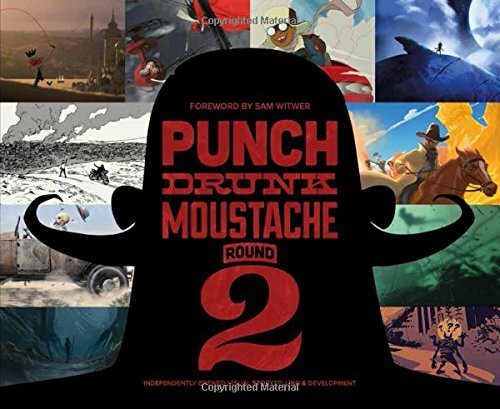 Punch Drunk Moustache is a visual development art book where each artist has to come up with a concept with narrative. So in addition to the art, there's a visual narrative that ties the images together. You can say it's a sort of comics anthology but the artists are given more leeway and a much larger canvas. Most are stories without text while a handful are illustrated like picture books with text. The artworks are beautiful. I like that with more artists, there are now more styles and story genres to check out. Amy Beth Christenson's story is about a girl whose tribe was wiped out, and she has to explore the planet that's left behind. Haunting scenes are included. Jeff Sangallli's story is about his favourite toy being taken away by ladybugs. There are 10 short stories to enjoy, each with its own creative direction. It's a nice sequel to the first volume.